These Sheet Pan Pesto Chicken Meal Prep Bowls are a delicious way to enjoy your veggies and basil pesto, and they're a low carb lunch idea that comes together in 30 minutes! Preheat oven to 400 F. In a Magic Bullet, blender or food processor, blend 2 tbsp olive oil, basil, parmesan cheese, garlic, salt and pepper together until smooth (you may need to add 1-2 tsp of water to get it to blend). You will only use about half of the pesto; either cut the recipe in half for this serving or save the rest for another meal. 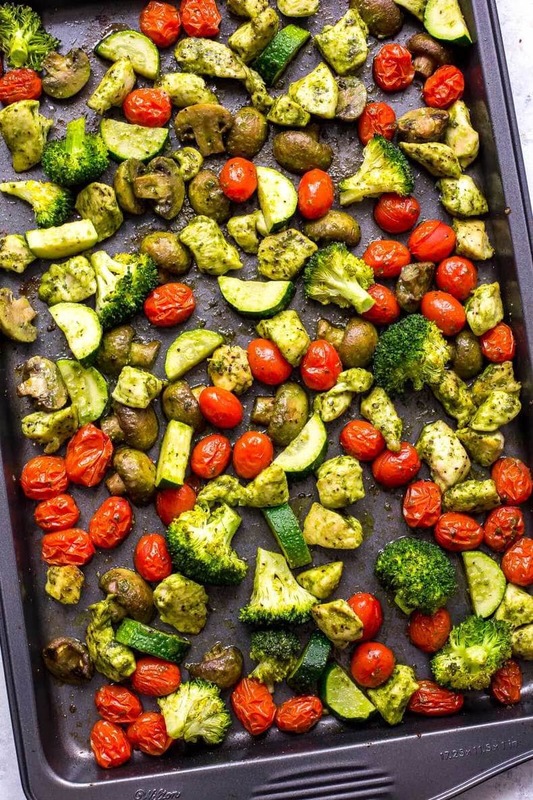 Add chicken and mushrooms to large sheet pan and toss with 1 tbsp of olive oil and 2 tbsp of pesto. Bake in oven for 10 minutes. Remove from oven and drain excess liquid. Add remaining vegetables and another 1-2 tbsp of pesto. Toss to combine then bake another 10 minutes until chicken is fully cooked. Remove from oven and divide among 4 meal prep bowls. Keeps in fridge up to 5 days.